2. John Boehner on the hot seat. The House Speaker is under pressure from all sides over the shutdown. Hardline conservatives want him to stand firm, but Senate Democrats are pushing back. "He's sitting on a bill that would reopen the government right now. This bill would pass in a manner of minutes if he'd just let Democrats and Republicans vote," said Senate Majority Leader Harry Reid. 15 House Republicans are also calling on Boehner to bring a clean continuing resolution to the House floor for a vote. 3. Debt ceiling dilemma. Will the debt ceiling fall victim to politics? President Obama met with more than a dozen bank chiefs, who warned that the economy could suffer a severe setback if the shutdown and especially the debt limit aren't resolved. "There's a consensus that we shouldn't do anything that hurts this recovery that is shallow, not well established and is quite vulnerable and the shutdown of the government, but particularly a failure to raise the debt ceiling would accomplish that," said Goldman Sachs CEO Lloyd Blankfein. 4. Jobs numbers. According to ADP, the private payroll firm, the private sector added 166,000 jobs in September. That's fewer than expected. Can we expect a disappointing unemployment report later this week? The Labor department is supposed to release its September jobs report Friday, but that could be put on hold because of the government shutdown. 5. 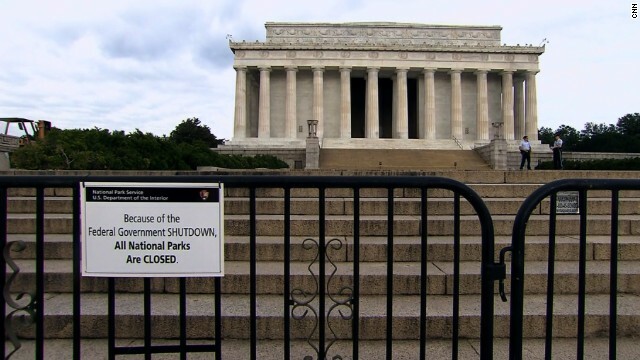 Shutdown’s painful effects. The National Institutes of Health has been forced to halt new clinical trials because it has run out of funding. Cancer patient Michelle Langbehn, who has been undergoing treatment with a promising new drug, said she is "furious." "They are denying or delaying potentially life-saving treatment to Americans in need of a miracle," Langbehn said.